Konda's crime against the kami had been revealed: He had stolen a living spirit. The abductee wasn't just any kami, though, but a scion of the O-Kagachi, guardian of the boundary between the material and spirit worlds. Konda's act utterly destabilized Kamigawa, and disorder spread on both sides of the great war. Seeing an opportunity, the akki horde marched on Eiganjo even as the O-Kagachi itself attacked the castle. All the while, Toshiro Umezawa played all the sparring factions against each other, deftly exploiting his allegiances to wrest That Which Was Taken from Konda's hands. Amidst this pandemonium emerged the one who had set everything in motion: the Kami of the Crescent Moon, an ambitious trickster who hoped to remake the world on his own terms. But the Crescent Moon had made a very powerful enemy in the ogre-mage Hidetsugu, who held the power to unleash the all-consuming Oni of Chaos on the world. As the O-Kagachi raged against Konda, who was protected only by the power of the kidnapped kami, the veil between the material world and the spirit world was torn to tatters. The distinction between spirit and living being blurred completely. And the war rose to a fever pitch, spurred on by the blind pride of Konda and the blind fury of the O-Kagachi. Kamigawa's last hope for peace lay in the hands of Toshiro Umezawa and Michiko Konda, the daimyo's sole heir. Get ready for the Saviors of Kamigawa! 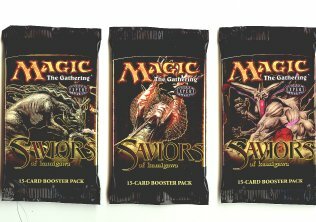 Other products in the "Magic The Gathering" series. I love Magic the Gathering it has so many new cards making always wanting to buy more! This game requires strategy unlike Yu-Gi-Oh! I love Magic and nothing absorbs my free-time better.